Charlton's former Posh striker Nicky Ajose. Manager Grant McCann has warned the rest of League One that Peterborough United haven’t hit top gear yet. 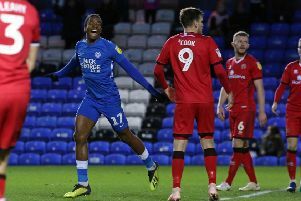 Posh are sixth in League One ahead of tomorrow’s (December 17) trip to Charlton and McCann believes his side will only get better as the season progresses. On-loan Posh midfielder George Moncur. He also believes Charlton will improve under new manager Karl Robinson. The Londoners are currently 11th in League One, but a win tomorrow would move them to within a point of Posh. McCann thinks Charlton have one of the strongest squads in the division, but he wants his players to play the team rather than the names on the home teamsheet. “Charlton are a massive club for League One,” McCann stated. “They’ve had their problems, but you just have to look at their squad list to see they have one of the biggest budgets in the division. “They have an impressive list of striker with Nicky Ajose, Josh Magennis, Lee Novak and Ademola Lookman. Premier League clubs are supposed to be looking at Lookman. New Charlton manager Karl Robinson. “Then they have the experience of Johnnie Jackson and Andrew Crofts in midfield so it’s a good squad. but is it any better than ours? “We are in a great place right now and the good thing for me is that we are only going to get better. We haven’t hit fourth gear yet and yet we are sixth. “We are going well because we have a team that plays and runs for 90 minutes. The number of late goals we have scored is proof of that. “We are confident going into tomorrow. We know Karl Robinson well and how he sets his teams up. We’ve played against his teams twice already this season and the one certainty tomorrow is two teams trying to play good football. “On our day we are as good as anyone, but it’s also true that if we play like we did in the first-half of last weekend’s game we can be beaten by anyone. I have no doubt we will play well in the second half of a game, but we must start matches better. If we play like we did for 45 minutes against Chesterfield we will get blown away by Charlton. Star man Marcus Maddison will be back in the squad for the trip to the Valley, but he’s not certain to start. McCann is considering a change to the starting line-up and claims on-loan pair George Moncur and Nathan Oduwa are also in contention. The manager also revealed he will be moving players on in January. McCann added: “I surprised the chairman the other day by telling him we still had 32 players on the books, including those who are currently out on loan. “That’s too many for me to manage. We probably have some disillusioned players in the building who are a long way from the first team. “I will speak to some in January and explain that their game time will be limited and they should probably try and get some match time somewhere else. Ideally my squad will be 22/23 players at the most.